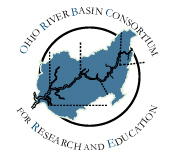 The Ohio Basin Consortium for Research and Education (ORBCRE), as its mandate, has the acquisition and dissemination of knowledge about the Ohio River Basin. Comprised of universities, colleges, industries, businesses, and governmental agencies, we reach varied memberships in the basin and promote information exchange in our annual symposia and meetings. As a 501 (c) (3) non-profit organization, we would like you to be aware of us and consider ORBCRE as a worthy recipient of penalties or fines from judicial or agency decisions as part of settlements for environmental damage to the Ohio River, its tributaries, or the basin. The ORBCRE is an excellent vehicle to promote discussion of environmental problems, to disseminate environmental information, and to conduct research on issues of environmental concern to the Ohio River Basin. Our annual symposia are held in different cities and towns in the basin bringing local press attention to current problems in the basin. We have symposium sessions dedicated to the discussion of environmental pollution incidents from issues as varied as metal coagulants, coal slurry, oil spills, and algal blooms. In our research sessions we describe topical environmental problems and proposed solutions to these problems. In our educational sessions, we present environmental outreach oriented programs to teachers, undergraduate collegiate students, and the public. For research, education, public dissemination and awareness, the ORBCRE is a worthy non-profit to whom penalty and fines for pollution or misuse of the resources of the Ohio River and its tributaries, can be directed. Thank you for considering us as a worthy option for this type of funds. Attached are related materials about us. Please do not hesitate to contact me or visit our web site, http://www.orbcre.org for more information. I look forward to hearing from and working with you in the near future.